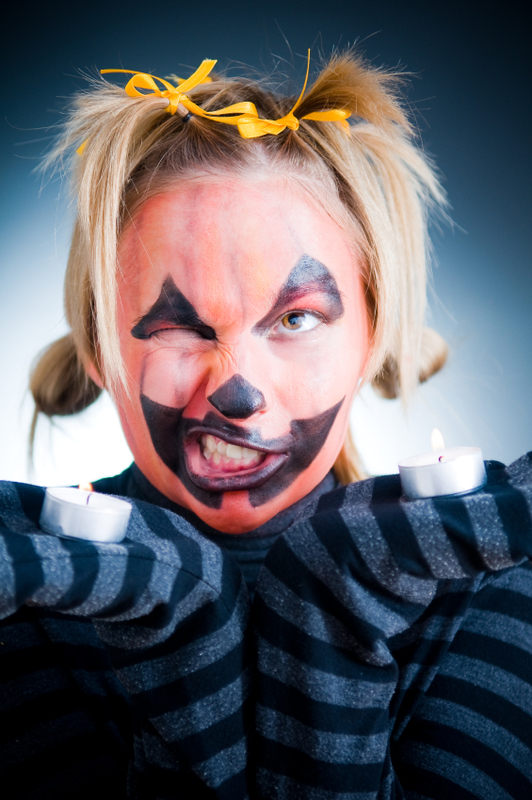 Face painting is an artful craft that can be used year round for any sort of dress up activity. Whether it's for a Christmas play or a carnival, face painting is a skill you can use to let your fantasies take flight. Cover the eye region and upper face with a solid color paint using a wedge applicator. Go in with black liner pencil and white face paint to create stars, lines and musical notes. Finish with a coat of glitter and some purple lipstick. These symmetrical swans are perfect for any number of events from costume parties to festivals and fairs. Trace the outline of the two swans above the eyes using a black pencil. Fill in the swan bodies with a mix of blue, white, purple and pink stripes. Start each line from the inner eye and pull it outward. Pull the same colors from the corners and below the eyes to accent. Whether you're attending a fairy festival or you just want to add a touch of spring to your face, consider a flower vine. Trace the vine in a solid color along the side of the face, including several small "branches". Add a few flowers along the vine itself using the same color of the vine for the petals. Add flowers to the ends of the vine and each branch, using a contrasting color, and tie the flowers together by giving them the same yellow centers. This explosive eye makeup makes a statement at any spring gathering. Wear a matching lily somewhere on your body to double the effect. Trace the petals around your eye using a bold-colored paint. Follow the interior line of each petal with yellow paint to highlight. Brush in some white face paint on the petals to fill in the centers, and go back in with a very thin brush to add a touch of darker color to the centers. This spooky look is perfect for Halloween, but it can also be used for a Goth party or dark-themed event. Swipe on some dark red eye shadow and pair it with heavy black eyeliner. Use the eyeliner to create curving, interconnected lines for the webs. Use the same red eyeshadow to draw a dot in between the eyes, and outline it with the eyeliner to create a spider. Glue some face jewels onto the webs to accent them. Paint your face with this leaf design for Earth day or a spring or fall festival. Trace a line from one temple down toward the jaw with brown face paint. Branch off the first line with several smaller "twigs". Add a leaf at the end of each twig. If desired, stretch twigs to the eye and mouth, and outline them in green to bring them into the design. Give your favorite superhero an alternative identity with this fun mask. Cover the eyelids and eyebrows with white face paint using a wedge applicator, and bring the outside edge of each eye up to a point. Fill in the area around the eyes, across the forehead, and down to the bridge of the nose with blue. Outline the eye area with black and draw the spider web design on the blue. Don't forget to add the spider in the middle. This fantasy mask is perfect for any occasion from Renaissance faires to costume parties. The gold glitter face paint adds a lot of dimension and sparkle to the design. Use purple eye shadow to draw an inverted triangle below each eye. Use green eye shadow to draw triangles above each eye with the inner corners of each triangle stretching down to meet each other between the eyes. Use a gold glitter face paint pen to draw lines, dots and scrolls on the eye shadow to complete the look. Capture the spirit of Mardi Gras with a face paint mask. This versatile mask design can be done in any combination of colors to continuously update the effect. Cover your eye brow and inner eye down the outside of your nose with heavy black paint. Cover your eyelids up to the brow with metallic face paint. Cover the area just below your eye with the same metallic paint. Trace the outline of a mask around both eyes, and fill in the interior with contrasting metallic paint. Draw a scalloped outer edge on the mask, and fill it in with metallic paint. Add some black curlicues to embellish. From fairs to Halloween costume parties, a butterfly face paint "mask" will always be in style. Cover your eye lids and the area just below your eye with pink/red face paint. Cover your upper cheekbones and the area above your eyebrows with a darker red color. Pull a line of yellow face paint down the sides of your face, just outside the pink and red. Pull a line of blue face paint just outside the yellow. Draw butterfly wings in black on top of the color base. Add face jewels to finish. For more face paint ideas, check out Animal Face Painting.